Moroccan Meatballs with Roasted Garlic Flatbread — potato chips are not dinner. I had a meal very similar to this on our last night in Marrakech, at an amazing woman-owned restaturant Al Fassia . 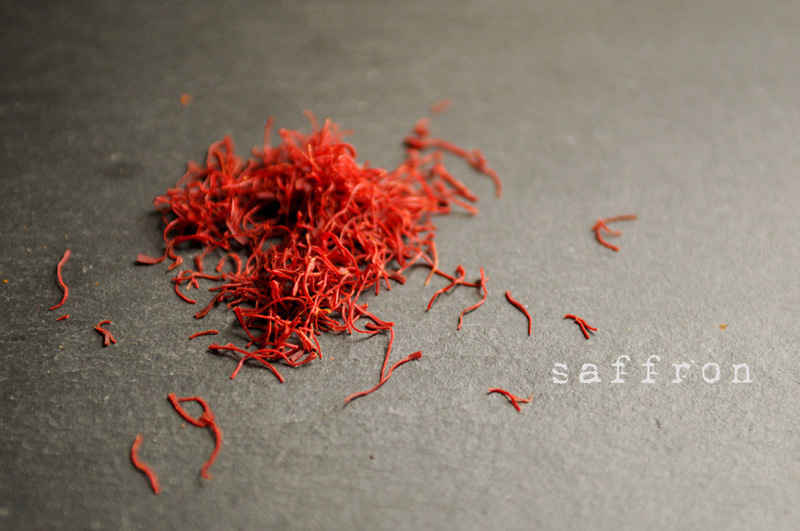 My favorite part was when everyone's tagines were brought out to the table and the cone was lifted, steam swirls escaping. Among the many dishes there was chicken with almonds, chicken with dates, pumpkin with caramelized onion, and of course piles and piles of couscous in the center of the table. Biased I may be, but the lamb meatballs in their flavorful sauce topped with a gorgeous runny egg in the center was my favorite tagine of them all. I am not one for overly sweet dishes and this had the perfect balance of flavor without crossing the line into syrupy-sweetness. I paired my version with garlic-roasted flatbread because I just love to dip bread into sauces but couscous would certainly accompany this dish just as well. The flatbread was amazingly easy to make and turned out nice and crispy on the outside but still chewy on the inside. The roasted garlic flavor was perfect dipped into the deeply flavorful tomato sauce. I also added garbanzo beans, which were such a great texture. And who doesn't love a dish topped with an egg? Preheat your oven to 375 degrees. In a large bowl combine ground lamb or beef, crushed garlic, grated onion, minced mint, egg, bread crumbs ras el-hanout, nutmeg, olive oil, salt, and pepper. I used the large side of a cheese grater over a bowl to grate my onion. Make sure you save the juice and add that too! It makes the meatballs so moist. Combine everything thoroughly with your hands (messy but the only way to really make sure everything is evenly distributed in my experience) Roll into balls of desired size, place on lightly oiled baking pan and bake for 25 minutes. Meanwhile, if making the roasted garlic flatbread, cut the 1/4 to 1/2 inch of the top of garlic cloves, drizzle each with olive oil until each clove is well coated, place in baking pan and cover with tin foil. Bake for 40 minutes. Prepare your flatbread dough by mixing together yeast, salt, olive oil, and warm water in a bowl, let stand for several minutes before gradually adding flour. Knead dough on a floured surface for about 10 minutes, or until the dough is no longer sticky. Brush the dough with a thin coating of olive oil then cover with kitchen towl and rest for about 45 minutes . The dough should double in size. Punch to flatten, then separate into 4 balls. Stretch each ball until you have a long, thin rectangular piece (no need to be perfect here) Brush each piece with olive oil, then top with roasted garlic and a light sprinkling of sea salt. Bake in a 400 degree oven for 10-12 minutes or until edges have browned. Keep warm under a kitchen towl until meatballs are ready. Saute onions and garlic in olive oil over medium heat until just barely browned. Then, tranfer to either a tagine, or deep skillet and add diced tomatoes, tomato paste, water, ras-el hanout, white pepper, and drained garbanzo beans. Simmer for 25 minutes, taste and add salt to your personal tastes. I used a tagine for this recipe to be authentic, but any large skillet or dutch oven will work just as well. Add meatballs to your tomato sauce. Crack an egg over meatballs and tomato sauce and allow the sauce to cook the egg until the whites are no longer transparent and the yolk is only just set. If you are not using a tagine, you can poach or fry the egg separately and just add it to your serving dish. Garnish with cilantro, if desired. 1. Preheat your oven to 375 degrees. In a large bowl combine ground lamb or beef, crushed garlic, grated onion, minced mint, egg, bread crumbs ras el-hanout,, nutmeg, olive oil, salt, and pepper. I used the large side of a cheese grater over a bowl to grate my onion. Make sure you save the juice and add that too! It makes the meatballs so moist. Combine everything thoroughly with your hands (messy but the only way to really make sure everything is evenly distributed in my experience) Roll into balls of desired size, place on lightly oiled baking pan and bake for 25 minutes. 2. *If you are not making the roasted garlic flatbread, skip to step 3* Meanwhile, if making the roasted garlic flatbread, cut the 1/4 to 1/2 inch of the top of garlic cloves, drizzle each with olive oil until each clove is well coated, place in baking pan and cover with tin foil. Bake for 40 minutes. 3. Saute onions and garlic in olive oil over medium heat until just barely browned. Then, tranfer to either a tagine, or deep skillet and add diced tomatoes, tomato paste, water, ras-el hanout, white pepper, and drained garbanzo beans. Simmer for 25 minutes, taste and add salt to your personal tastes. I used a tagine for this recipe to be authentic, but any large skillet or dutch oven will work just as well. 4. Add meatballs to your tomato sauce. 5. Crack an egg over meatballs and tomato sauce and allow the sauce to cook the egg until the whites are no longer transparent and the yolk is only just set. 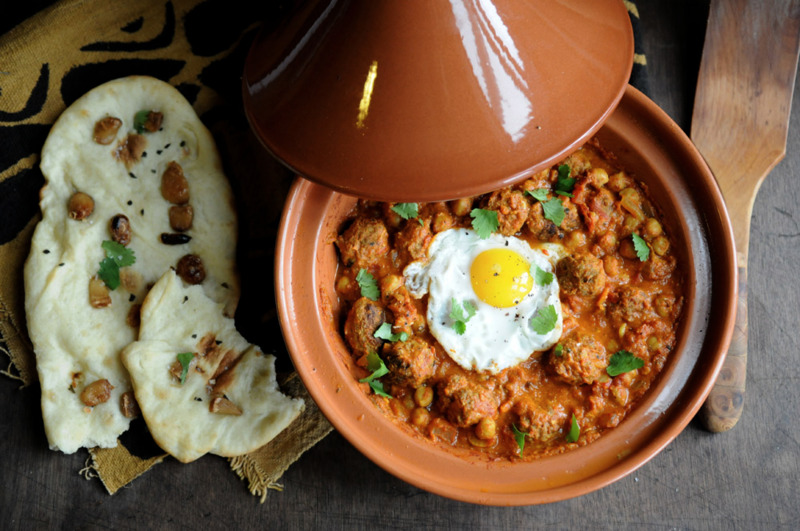 If you are not using a tagine, you can poach or fry the egg separately and just add it to your serving dish. Garnish with cilantro, if desired.